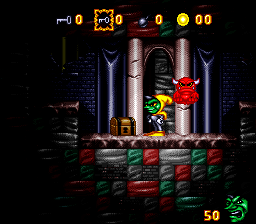 Dorque & Imp is an unreleased platform game by Swedish developer Norse. Thanks to Unseen64 for information here and of course to developer Peter Waher for sharing the demo levels! The game was almost complete, just as you assume. We also had contacts with publishers who wanted to publish the game, if we changed some of the contents. 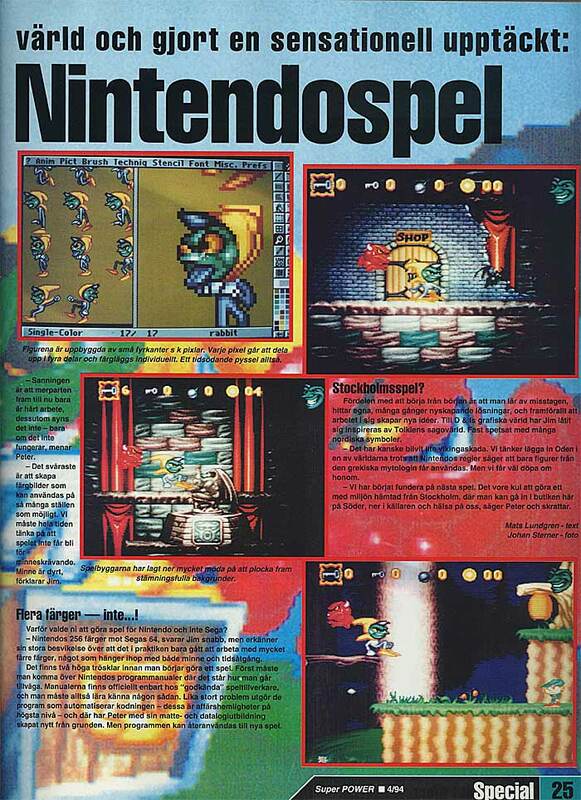 The Lost Levels post by "akuma" had a translation of a preview in the Norwegian equivalent of Nintendo Power, Power Player. The translation is below, unfortunately I did not save the original scans, posted nearly 10 years ago. 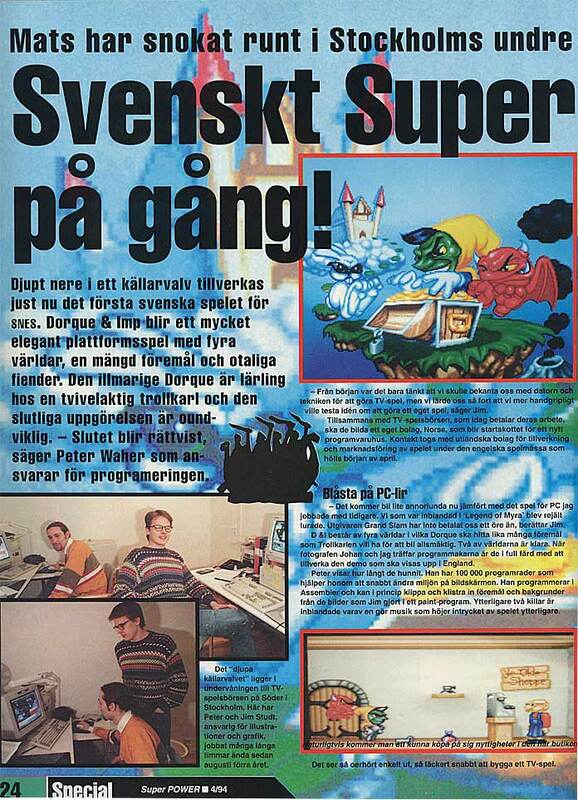 Super Nintendo games are now being developed in Sweden! We are used to thinking that Nintendo games are being developed in Japan, USA or England. Maybe sometimes a stumbler from France or Germany, but the fact that söta bror (=kind brother, Norwegian nickname for Sweden) would make a game for Nintendo is something few would dream of. But right now, the first Swedish SNES game is being developed in this basement location in Stockholm. Dorque & Imp will be an elegant platformer with 4 worlds, a plethora of items and countless enemies. The clever Dorque is an apprentice of a rather sketchy wizard, and a showdown between the two is inevitable. -The end will be fair, says Peter Wahler, who is responsible for the programming. -To begin with we just thought we should get used to the computer and the technique that goes into making video games, but we caught on so quickly that we decided we dared start making our own game, says Jim Studt, the person responsible for the graphics. -It's gonna be different now, compared to the PC games i have worked on. We who were involved with Legend of Myra were fooled completely. The publisher, Grand Slam has yet to pay us a single dime, Jim says. Dorque and Imp consists of 4 worlds, where Dorque sets out to find as many items as the wizard needs to become allmighty. 2 of the worlds are completed. When Power Player catches up with the team of programmers, they are already hard at work to finish up the demo that will be shown in England. Peter shows us how far they are come. He has 100 000 command lines which helps him to quickly change the envoirment on the screen. He is programming in assembler, and can in principal cut and paste artifacts and backgrounds from the pictures that Jim has created in a image software program. Two other guys are part of the team, one of them for the music. It looks so simple and fun to make a video game. -The truth is that most of the work up till now has been hard. And also you can't see it - only if it's not working, Peter explains. - The hardest part is making colored pictures that can be used in as many places as possible. We always have to remember that the game can't take up too much memory, memory is expensive, Jim explains. Not that many colors afterall. Why are you making a game for Nintendo and not Sega? -Nintendo's 256 colors versus Sega's 64, Jim answers quickly, but he does admit he is dissapointed he has to settle with less colors because of memory and time issues. - There is 2 high thresholds you have to overcome before you start creating games. First you have to obtain Nintendo's programming manuals, which explains how you get started. These manuals are only available at "certified" game developers, and you have to know one of these. The advantage of starting out on your own is that you learn from your mistakes, find your own and maybe groundbreaking solutions and most of all get new ideas from the development. For Dorque & Imp's graphical world Jim has been inspired by Tolkien's fantasy world, and spiced it with a few nordic elements. -It may have gotten some viking inspiration. We had the idea of including Odin to one of the worlds, even though Nintendo only allows the use of Greek gods to be used in games on their systems. But we can always rename him. -We have begun thinking about doing a sequel. It would be fun to make something that has it's story lifted from Stockholm, where you could go our shop here and say hello to us, Peter laughs. There was also a preview in the Swedish magazine, SuperPower. The website from the original publisher has a scan of the article. It shows the game in a state that appears to be more advanced than the demos (at least the HUD layout is different). I mirrored the scans below. Alas, even though I lived in Sweden for over a year, I don't know any Swedish to translate! 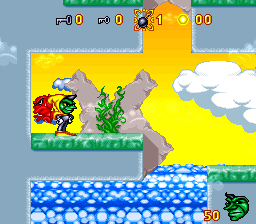 More recently, Piko Interactive acquired the assets from the original developers and made a completed version of the game, renamed Dorke and Ymp. From the looks of the screenshots, they fixed some of the issues that are present in the demo levels. Note that they didn't necessarily use any of these samples in the actual game! Daniel Adler was one of the programmers of Dorque & Imp. 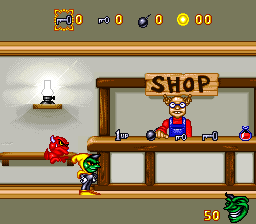 Peter Waher posted three levels of the game. The graphics look pretty good, though I find the main character, Dorque, waving his arms around without moving his head to be a bit creepy for some reason. The music is really driving, but is somewhat muted. Imp is the sidekick, who spits stuff out of his mouth, and is the main means of attack. You can also use him to float you up to higher platforms, but in these demos it is hit or miss whether or not works effectively. 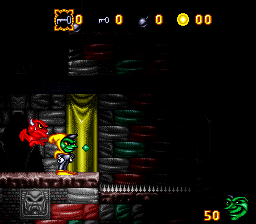 You can collect keys and bombs, which you can activate by pressing select. There are three levels, described below. Overall, it shows a game that is in the midst of development, and has not be play tested that much. Probably the most complete of the three levels is the mine level. 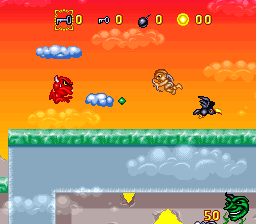 The main problem is that the lit area of the screen is too small to be able to see the enemies before you hit them. There are also places where it is pretty much impossible to advance without taking a hit on spikes. Fighting cupids and crows Sky Palace? 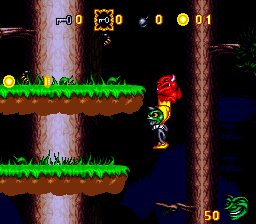 This level is also fairly complete. I found places where it was possible to get stuck if you didn't have the right items, though. I tried as a ton of times, I could not reach the topmost platform that has the key you need to proceed further into the level. Definitely not done yet. Preview in the Swedish magazine SuperPower (page 1). From here. Preview in the Swedish magazine SuperPower (page 2). From here.